This cutie can be stitched all of it’s own as a pretty little design with a jungle feel… Many nice Special Stitches give you a taste of “Châtelaine” on a small project. Threads used are the same as in the main Design ONL 157 – “The Rainforest Mandala” ! 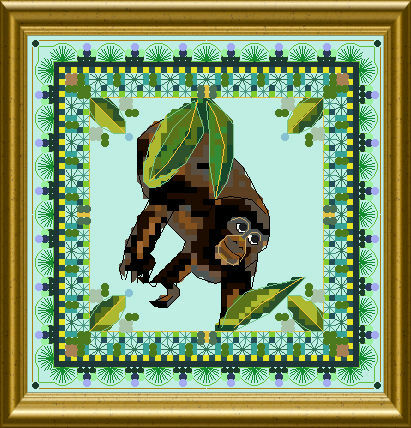 The stitchers of this larger design can use the little monkey – minus the ornamental border ! – as an insert in place of the right upper side snake…..
Yesss please I realy like the little monkey!! He is such a cute fella!! He reminds me that I am a little monkey!! All the shelves are soo high here, I climb almost everyday! 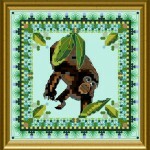 Would love this little guy to stitch separately or add to my Rainforest pattern. Hello Martina! Oh sure, I want him! I’m absolutely in love with this little guy. not sure why but cant seem to download it…weird…never had a problem before? so cute !! I want him ! I love this little monkey and would love to stitch him! I am a huge fan of all your designs and have almost all of the ones available to me in paper form. If the others were available that way, I would have them, as well! I am working on The Knotgarden right now and I love it! I am a member of several Chatelaine Facebook groups, and love seeing everyone’s beautiful stitching! Shaleen, the good thing with the PDF formate of my designs is, that you can print them on paper in any enlargement you need. Which can make it much easier to the eye for those who need it.